Last week the nation woke to the breaking news that, according to a survey conducted by online retailer Littlewoods, 67 per cent of women admitted to controlling their partner’s style. In an age where KimYe are considered a golden couple, it hardly comes as a surprise. Their sometimes matching Givenchy outfits and dedication to dressing in a ‘full look’, even if they’re just nipping out to Whole Foods, is admirable. And while David and Victoria Beckham may have ditched their ‘his and hers’ Dolce & Gabbana outfits, they still certainly enjoy being hailed as one of the world’s most style-conscious couples. Celebrity gossip aside, the reality is men have been getting style advice in all shapes and sizes for decades. At the end of the day, we all want to look our best and, ultimately, impress those that matter. While we’re not suggesting you should allow the women in your life to dictate your style, we thought this would be a good opportunity to ask a few with insider knowledge what they personally looked for. With that in mind, we spoke to five female professionals who work in menswear to get their thoughts on how men should be dressing in 2015. “Nothing is less attractive in my opinion than the clothes wearing the man. Maketh the man, always! “I kind of hate the pressure that people feel from the word ‘trend’. I think if you are naturally observant, then buying into a trend is something that just naturally happens. 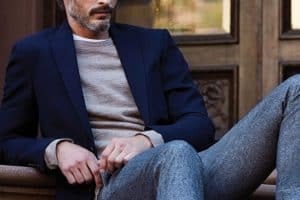 “A white crew neck t-shirt, a good quality grey cashmere sweater, a simple navy wool overcoat – women love it when men keep clothes simple. “A few splashes here and there can be good and will easily update clothes you already own. Try to accessorise with colour though, rather than incorporate it into a whole look. “Attention to detail is a big sartorial turn on for me, bad jeans are the opposite of this. So, it seems women don’t actually expect too much from us when it comes to our attire – stick to the classics, develop your own identity, and don’t try too hard. Oh, and the greatest accessory a man can own? Confidence. Does this mean we should all stop worrying so much about how we look? Or do you dress the way you do for yourself, and yourself alone? How many of you regularly seek out your partner’s or female friends’ advice when it comes to fashion and style?